A lunar eclipse occurs when the moon is opposite the Sun, the earth is in between and casts its shadow on the moon. It only occurs during a Full Moon but not every month. 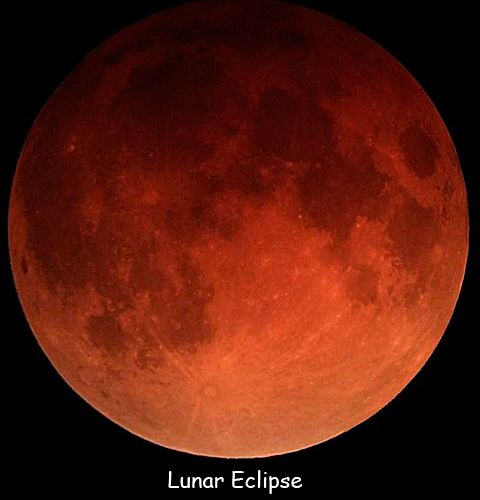 There are three different types of lunar eclipses including: total, partial and penumbral. During an eclipse the moon looks reddish, which is also called a blood moon. At its maximum, an eclipse can last for 3 hours and 40 minutes. You can also witness an eclipse while standing on the moon. The earth will appear dark to you because the Sun would be behind it. A lunar eclipse can occur three times in a year. During the 21st century there was a total of 85 eclipses. Only a portion of the Moon passes through the Earth’s shadow during a partial eclipse. In astronomy, the more specific term used is ‘Syzygy’ for an event in which three celestial bodies are configured in a straight line. The eclipse occurring on the nights of July 27-28, 2018 will be the longest eclipse this century. An eclipse occurs only when the full moon is at one of the nodes of the lunar orbit, a place where two tracks intersect. The lunar orbit is elliptical in shape. The darkness during a total lunar eclipse can be described using the Danjon Scale. It has 5 points starting from 0 to 4. Lunar eclipses occur more often than solar eclipses as the shadow cast by the earth is a bit larger than the moon. During an eclipse hundreds of hot spots have appeared on large areas on the moon’s surface reportedly. Declan, Tobin. " Fun Facts for Kids about Lunar Eclipse ." Easy Science for Kids, Apr 2019. Web. 18 Apr 2019. < https://easyscienceforkids.com/lunar-eclipse/ >.